This week has been long guys, and I think that they’re only going to get longer from here. I’m tired and uncomfortable most days. Sleep still evades me which is so annoying. I’m so ready for her to be born. Sonic ice is still my fave, in case you were wondering. The weather is starting to get hot in the mid to upper 80s. The boys want to play outside daily. I usually just sit in the lawn chair and watch them run in the yard but the heat gets to me after a while. I have been noticing some slight swelling in my hands (mostly my fingers). I took my mother’s ring off a few weeks ago because it has always fit tighter than my other rings. I wonder if I’ll need to take them off any time soon as well. I posted a flashback photo from last year vs this year on my Instagram and I noticed that my face is definitely fuller now. I showed it to Javier and the first thing he said was “your cheeks are chubbier.” Thanks babe. Next week we will find out if I’ve dilated at all (fingers crossed). I got my yoga ball out over the weekend. I haven’t been able to use it much because the boys are fascinated with it. I’m waiting for that to wear off so that I can watch TV and sit on it to hopefully get baby down lower (though she feels pretty low to me now). I lost a very small piece of mucus plug this week. It wasn’t bloody or brown, but that made me kind of excited that things are headed in the right direction. Hopefully my appointment next week will confirm that. 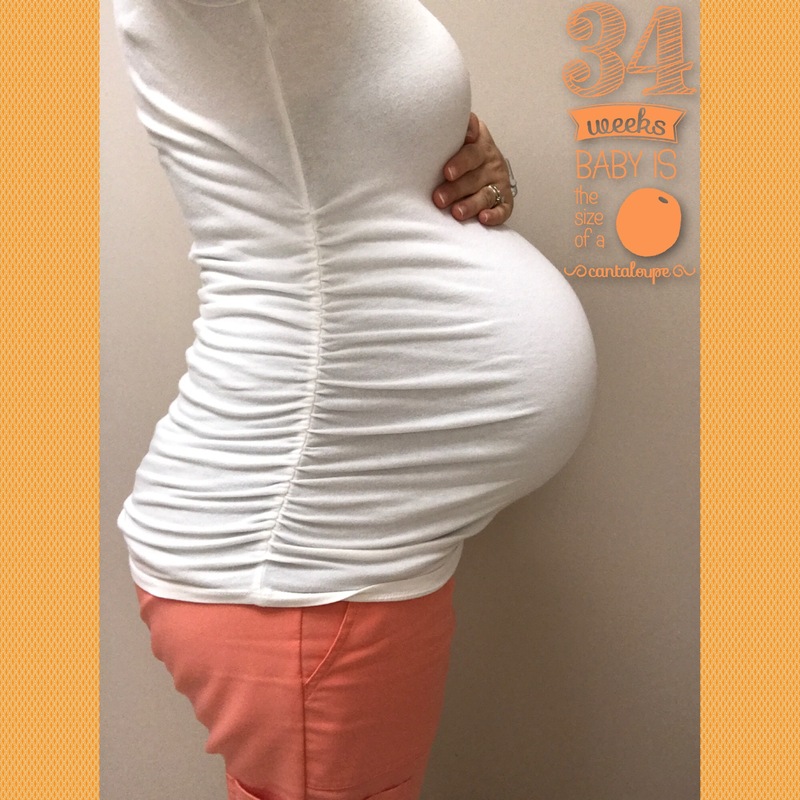 This entry was posted in Family in the making and tagged 34 weeks, baby, bumpdate, pregnancy, pregnancy update, pregnant, TTC. Bookmark the permalink.